I went shopping at Garden City with my Mum and Grandma - Mum normally spends Sundays going to the flea markets with my Dad, but he's picked up a weekend job, so she asked me to take her shopping! For some reason I don't actually find the Miss Mauds large sized cakes tasty, but I much prefer the taste of their smaller individual cakes instead? I was cleaning up my dressing table (it gets really messy over the week), and I found a whole bunch of samples that I'd just been storing, rather than using. I selected a few I was interested in trying, and vowed to finish them within one week. I didn't use them all, but only because my skin's been a little unbalanced recently, so I've put these samples on hold till my skin's back to normal. Selfie of the day! Went to work, came home from work, took a selfie. End of story. First clothing haul of the month! A sweet white top and two pairs of pants/jeggings. One in black, with a suede-like swirly pattern, and a milky pink pair. Y'all know I'm a skirts/dress girl, so these are the first pants I've bought in years?! I've only worn the black pair so far, but I love them! ??? Can't recall doing anything interesting! No photos on my phone on this date either. Sparkly, glittery shoes to celebrate the upcoming weekend! Bought fantales to celebrate too - haven't eaten these in years since I had braces. I missed the chewy sticky texture! Popped into Priceline to stock up on some Maybelline Baby Lips balms while the 50% off sale was still going on. I picked up some Color Tattoos and a mascara a week earlier, but I'll show you that in my haul post later on. Unpacked my bag to see I've been lugging around 6 lippies, a lip gloss, and 2 lip balms, which had accumulated over the week. Click here if you'd like to see the what's in my handbag post, that I recently did. And then I went for Japanese food again! This time I had Katsu Chicken Don, and then I bought the Soft Crab Shell set to take home to share. Slept in, lazed around at home. Recently finished my current HG bb cream the Lioele Triple the Solution BB Cream, and now I think I'm falling back in love with my previous HG, the Etude House Precious Mineral Bright Fit BB Cream (haven't re-reviewed for you since they reformulated it a year or so ago, but let me say the current version's better than the previous precious minerals version!). 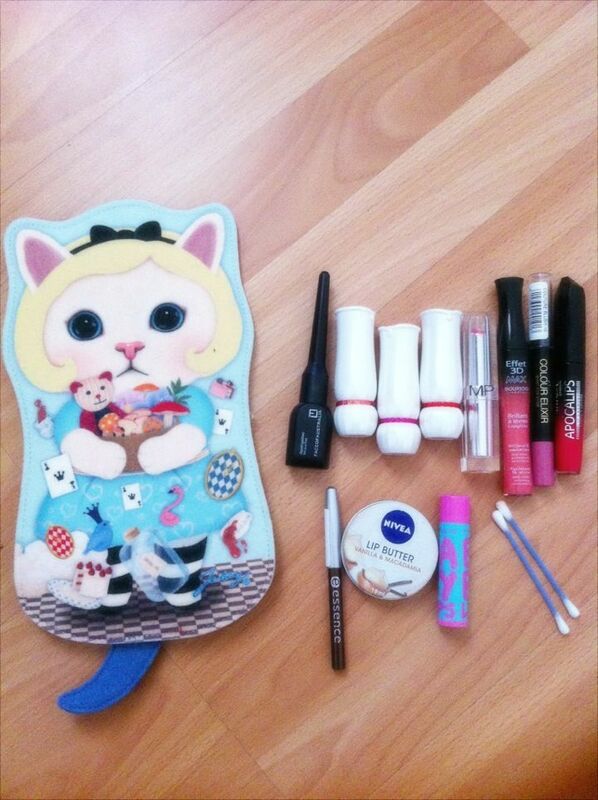 Lioele's got better coverage and more long wearing, but Etude's lighter, and has that dewiness that I like. Mum wanted to go shopping again since Dad's busy. We went to Carousal this time, but I made my brother drive because the traffic around that area is just insane - though it was much less busier on a Sunday compared to a weekday. We had grilled burgers for lunch - I had Moroccan Lamb something or other. And then Lychee bubble tea to top it off. I wasn't able to do much shopping, but I did make another impulse purchase with another cat ear headband to add to my collection. It was from Gloss Cosmetics, and only $3.90 - even cheaper than similar styles on ebay! Thanks for reading lovelies. Should I do more posts like this in the future? All the food looks so delicious! I love the cat ears headband and hat <3 Mickey looks so cute! I need to get snapping more on my phone - it's always fun to see a summary of your week :D This was really interesting! That hat with the ears is super adorable - I think I need those in my life! I love the sparkliness of them! Thanks Mei! Hehe, I can't wait to wear that hat! Hehe, I'm a sweetaholic as well! It was delicious ^_^ I can't wait to wear the cat hat! It's delish! Yep, can't wait to wear that hat! I'm kinda snap happy ever since I got onto instagram! Sometimes I take really random uninteresting pics tho, lol. Thanks! That burgundy shirt is my current fave~! They must keep improving the formula ^_^ I'm forever grateful to my friend who first gave me the etude bb cream, couldn't live without it now, lol! Oh really cute pics dear, many thanks for share! Hey, that's cool ^_^ Yay for us Perth gals!